The population is now about 7 billion, up from 3 billion just five decades ago. And it continues to climb, expected to exceed 9 billion by 2050. The world is chock-full of resources, but they may be starting to dwindle under the strain. Some experts foresee shortages of food and water; others wonder where we will get our energy, acknowledging that the “easy oil era” has come to a close. And of course, our massive CO2 output coupled with rapid development, pollution and deforestation is devastating our ecology at a truly alarming rate. But I want to explore a much more benign – if still unpleasant – side effect of having so many people on the planet: the impact of tourism. I just returned from Puerto Rico, a lovely trip. 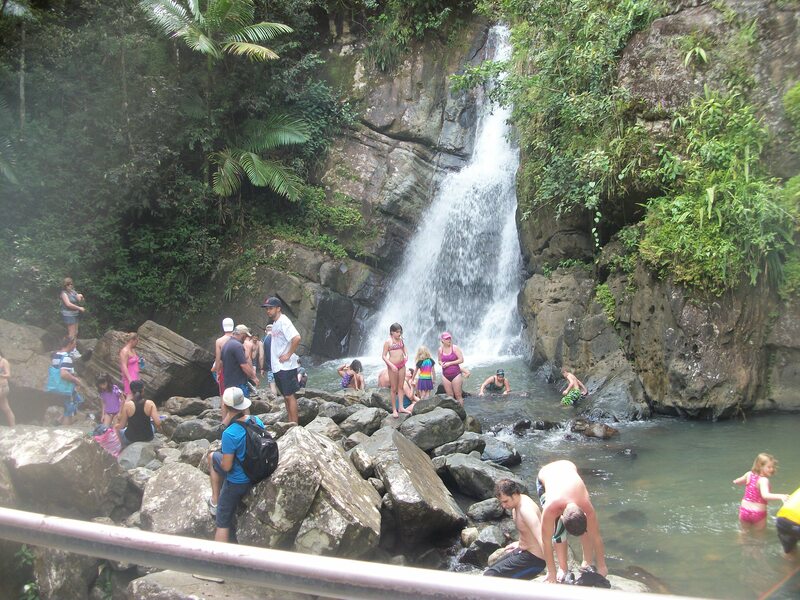 While I was hiking in El Yunque, however, I felt like I was in the Disneyland version of a rainforest. The main road was full of cars and exhaust-spewing tour buses; the lookout points and waterfalls swarmed with sightseers. I mean there were dozens upon dozens. I realize that I, too, was a tourist. The irony is that everyone wishes that they could be the only one there. On a side note, I highly recommend A Peoples’ History of the United States, by Howard Zinn. In chapter one, he explores how Columbus and co. utterly destroyed these innocent peoples and their culture. You can read it here. After exploring the main island, we headed to Vieques, which boasts “the world’s brightest bay” according to the Guinness Book of World Records. Mosquito Bay is a bioluminescent bay – the water literally glows when it is disturbed due to the presence of tiny dinoflagellates. We went and it was magical. But again, the experience also caused me to reflect and left me rather saddened. Because the bay isn’t actually the world’s brightest. The title used to belong to a bay in Jamaica, but they lost the honor because they constructed a giant arena on the shore; the glare from the stadium and the boat traffic was so bright and disruptive that you can no longer see the natural glow in its full glory. The same thing happened to the bio bays around Fajardo, a city on the main island of Puerto Rico. The lights from the city drown out the waters’ sparkle. There are several places around the world that boast this same miracle, but they are being lost or have been lost to urban development and tourist disruption. Many organisms were killed by the run-off from DEET-containing bug spray. And now even Mosquito Bay is threatened. Our guide first arrived there when he was seven and grew up around the waters. He said he used to not be able to see his hand in front of his face. The utter darkness allowed the bay to shine. Now, due to growing popularity with tourists, the town around the bay, Esperanza, is built up and bright (although you can still see so many stars there than you can in most developed areas, a sight just as breathtaking to me as the stars in the water. Most places are so full of night pollution that they have already extinguished a natural wonder our ancestors took for granted). Now you have to kayak into a far corner of the bay to get the full effect. As per usual, the issue is complicated. I am one of the tourists I inadvertently malign. And tourism can be a boon for impoverished residents. Nevertheless it is sad to see formerly pristine environments and natural wonders being overrun and damaged – something that happens all over the world and will get worse as there are more and more of us on a finite sphere. In fact, there have been recent discussions of how increased tourism in Antarctica – one of the very few remaining untouched places – will harm this fragile ecosystem. Pollution, oil spills, and introduction of nonnative flora and fauna are a few of the concerns. So little remains of truly wild, uninhabited wildernesses, and when people invade (as I myself would like to), they often change it forever. The bay was black and it was his. Then shipped it all away. Lights from pretty houses on the hills. A shark darts beneath my kayak. Jeffrey is telling the group how he used to swim here as a child. Now no one is allowed. A ten grand fine. I dip my feet and hands in and think about what once was. I’m saddened as they pull our kayaks in.